A Helmsley business that specialises in traditional woodworking techniques has been chosen to help create the timber structures for Europe’s first pop up Shakespearean theatre, opening in York later this month. Duncombe Sawmill has been appointed to make the refreshments and merchandise buildings for Shakespeare’s Rose Theatre, which will entertain audiences between 25th June and 2nd September beside the iconic 13th century Clifford’s Tower in the heart of York. To add to the immersive Elizabethan experience, the organisers of the event, Lunchbox Theatrical Productions, are creating a free-to-enter Shakespearean Village outside the theatre, and asked Duncombe Sawmill to create rustic timber framed buildings, to be in keeping with the 16th century feel of the event. The traditional reed-thatched buildings will house a fully licensed bar, and some of Yorkshire’s finest street food vendors, who have been specially selected by Brian Turner, the Yorkshire-born celebrity chef and food ambassador for the Village. In addition there will be an oak-framed merchandise shop, offering a variety of souvenir items and books. Shakespeare’s Village will also feature an Elizabethan garden and a variety of free entertainment performed on a vintage wagon, as it would have been in the days of the Bard. Both of the buildings being produced by Duncombe Sawmill are made out of locally grown larch, sourced from the Castle Howard Estate, and supplied in kit form so they can be installed and removed quickly, and used in other locations. Duncombe Sawmill has been based in Helmsley for over 100 years, using local FSC timber to create gates, fencing, outdoor furniture and timber framed buildings with traditional woodworking techniques. Clients include the North York Moors National Park Authority, the Forestry Commission and London Fashion Week. 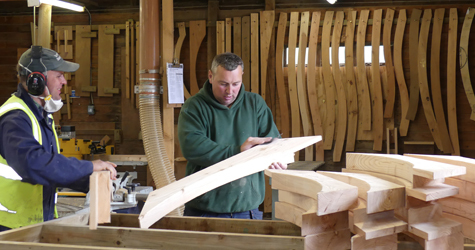 Three of the Sawmill’s talented joiners are working on bringing the project to life – Steve Shepherd, Eddie Garbutt and Kieran Windross. For more details of the theatre go to www.shakespearesrosetheatre.com. For more information about Duncombe Sawmill and other businesses in Helmsley log on to www.visithelmsley.co.uk or follow the town on social media www.facebook.com/visithelmsley or @visithelmsley on Twitter.